Possibly not the correct forum - mod please feel free to move. I'm struggling to get a 300psi low air volume compressor. I need this to set/check safety valves and proof/leak test some equipment which will run at 160psi or less. In my ignorance I bought one of these 12v 300 psi car inflater type pumps, but even with the hose blocked off and no leaks it barely makes 200 psi - I would send it back but it was so cheap its just not worth it. I've had a couple of crazy thoughts, like making an air powered pressure step up device, or enclosing duff pump in housing and pressurising the housing from my main compressor (100-130 psi) thus adding that pressure to the output. Considered using CO2 but the volume of the device is quite large, and I may have to do this test many times before I am satisfied (some of the home brew sites state a CO" cylinder can be picked up for as little as £17 - If this is the case then that may be the simplest option). Re: 300 psi compressor ?? Bloody dangerous proof-testing with compressed air. What you going to do if it fails the test? Fill whatever you are testing to the brim with water and gently warm it up. Pressure will soar without the inherent dangers of an uncontrolled release of compressed air. If there's a failiure all you'll get is a dribble of water not flying parts. Your quite right. The main assembly has already been proof tested using paraffin and a hand pump I made, however some parts can not be tested under those conditions. So this final test is to check rotating mechanical seals and other fittings, all rated well in excess of these pressures. As an aside I used this method with water once and pumped up this job to 400 psi. I thought I would let it sit a while and check for any pressure loss. So I went to have a coffee and the sun came out from behind the clouds and brightly shone on my test piece. When I got back the pressure was heading northward of 900 psi - way over the limits - so I don't leave things like that anymore. Even the gauge on this chinese pump reads about 20 psi low so I guess that goes with the low output. To be fair it was very cheap and is probably fine for inflating tires and stuff. Aah, sorry to presume your ignorance of the dangers, ut so many just don't realise. Better to be said so that others also understand. Although I can test a lot of the parts that way I can't use that method for checking the leakage on rotary/mechanical seals and suchlike as they have to be turning and it is not possible to do that with the pressurised chamber filled with liquid. Air powered step up device - sounds like a gas booster. Small ones are widely used by Divers for topping up SCUBA cylinders. They are not very complicated, most of the ones I've seen work at much higher pressures than 300 psi. I would have thought that a 300 psi version ought to be a reasonable workshop project, won't need a very big boost ratio. They tend to be noisy. 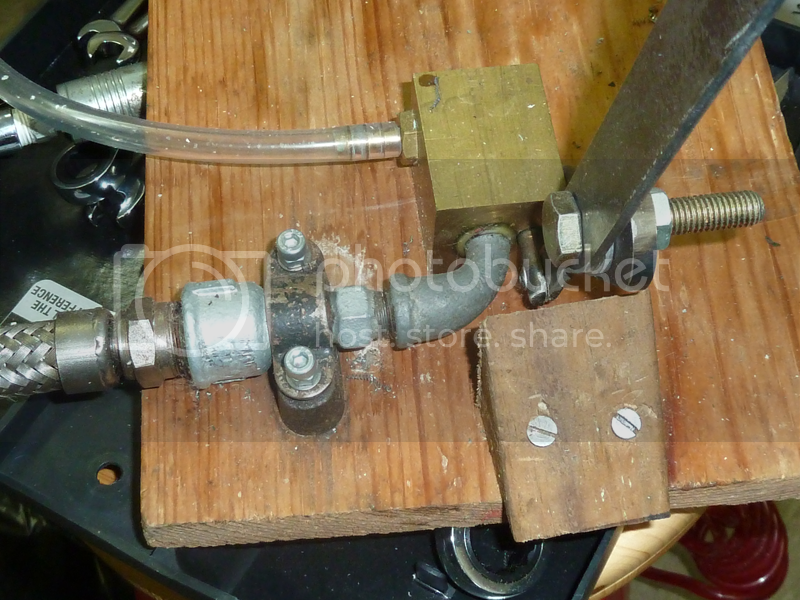 Your hydrostatic pump looks good to me and you have built it yourself. Well Done! Even with the store bought pump $$ , I have to stand with both feet on the mounting board to get to 1000psi + . The lever is about 3' long. Instead of buying one, I would of learn more making one. Paraffin = UK term for kerosene. As David Jupp has said, paraffin is the UK term for kerosene. When I first started I used water with car anti freeze to stop corrosion. But with complex parts there would often be liquid trapped inside and after a few weeks the anti freeze mixture would cause discoloration or even rust on susceptible materials. The switch to paraffin (kerosene) eliminated all of that and has the added benefit of lubrication and limited rust prevention.